This assessment provides a solid foundation for evaluating the strengths and weaknesses of your company. Globalization increases the need for companies and organizations to adapt rapidly to new and often unexpected situations. Political events change our perception of the world every day life is influenced by fundamental changes in the global economy and society structures, and new technology makes the impossible possible. Globalization is an inevitable challenge - and the ability to manage the changes effectively is crucial for successful management today. Multinational companies face an additional challenge. The cultural friction within a multinational company can be fierce, but difficult to locate and manage. 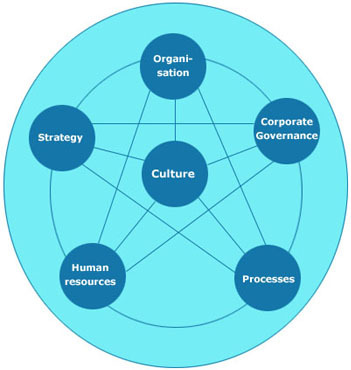 Frictions arise from the gap between corporate and national cultures in terms of values, motivation and reward systems, management style, organization and processes. Equally, frictions may arise from the differences between various national cultures working together. In order to be successful in a globalized world, these frictions must be located and dissolved. We can help you do that by means of our assessment tools and models, working through all levels of your company. A company or even a branch of a company can be seen as an organic entity, where all components are linked together in a strong, yet fragile system. 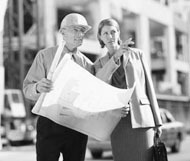 When discovering a malfunction or just a sign of weakness within this entity, it is crucial to carry out a thorough assessment locating the problem area before taking action. An example: Low customer satisfaction may be a result of various things, such as inconvenient management style, lack of cultural awareness, or bad resource management. Instead of making a lot of - unnecessary - changes, only the root of the problem should be dealt with. We often find that employees, middle managers and senior managers do not share the same view of the company’s strengths and weaknesses. An issue considered a problem by one group of people may not be perceived as a problem by others. This creates conflicts and friction blocking resources and energy. We elaborate a holistic picture of all levels of the company - pointing out potential areas of conflict and friction. This can help create a unified perception of the company, allowing everybody to work towards the same goals. In turn, this increases both employee and costumer satisfaction. The outcome of the assessment is a report covering various areas, including specific ones of particular interest to your company. All conclusions and suggestions are made on the basis of questionnaires and interviews with managers and employees at all levels of the company.